"Two indications of a person's character are what makes him laugh and what makes him cry." "The character is like white paper: if once blotted, it can hardly ever be made to appear white as before." "Meantime, bear your cross, and it will bear you. Seek an inward, not an outward change." "A tree will not only lie as it falls, but it will fall as it leans." "It is not what a man gets, but what he is, that he should think of. He should think first of his character, and then of his condition: for if he will have the former, he need have no fears about the latter. Character will draw condition after it. Circumstances obey principles." "Actions, looks, words, steps, form the alphabet by which you may spell characters." "The best characters are made by vigorous and persistent resistance to evil tendencies: whose amiability has been built upon the ruins of ill-temper, and whose generosity springs from an over-mastered and transformed selfishness. Such a character, built up in the presence of enemies, has far more attraction than one which is natively pleasing." "A holy man or woman has a character that penetrates and moves society wherever they dwell." "Make but few exceptions. 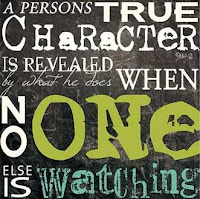 The character that cannot defend itself is not worth vindicating." "Since you were born of the Spirit, for it is He who gives you spiritual life. Read Romans 8:9. You are, therefore, spiritually alive, and you ought to be growing in Christian character and conduct. But in your earliest Christian experience there are defects in your inner nature which will always prevent your growing up to be like the Son of God until they are corrected. It is the filling with the Spirit which will correct these defects and will add to your personality positive qualities to make you like Jesus." "I am not concerned that I have no office; I am concerned how I may fit myself for one. I am not concerned that I am not known: I seek to be worthy to be known."